Francesco Totti with the World Cup, celebrating Italy's 2006 victory. Credit @pinterest.com. Whilst Roma’s 3-2 victory versus Genoa ensured they concluded the Serie A season in second place, one point ahead of their rivals Napoli, the victory seems to be most notable for the involvement of Francesco Totti. The captain, who turned 40 at the commencement of the season, was introduced as a second half substitute, and his involvement seemed to act as the catalyst in the home team’s victory, with their final two goals scored during this period. Whilst Perotti may take the short-term plaudits for scoring the winner, it seems more important to focus on Totti himself, due to his imminent retirement. Considering the Italian made his debut in 1993, his permanency seems to have been showcased, yet he may now have an opportunity to go down a new path, and advance his career, and legacy, further. Prior to the fixture, it seemed Totti may have featured for a large portion of the game, and played an integral part in his parting game with the club. Yet, considering the high stakes, manager Luciano Spalletti seemed to prioritise the victory, continuing his faith in a similar team which enabled him to win all three of his May fixtures. Although Eden Dzeko had earlier equalised for I Giallorossi, the scores remained level at half-time, and the eventual introduction of Totti seemed to boost both the fans and the players, and spur them to the three points. As such, his influence on the team, and the club in general, seems clear as, whilst the younger players seemed to play at a higher level than the captain, his involvement seemed to motivate his colleagues to enhance their own abilities, and conclude his career with a victory. With his Roma career spanning a quarter of a century, and having made his debut as a 16 year old, he seems to have outlasted multiple players, managers and staff. Whilst this longevity at the top level may be highlighted, perhaps his crowning glory is his loyalty to his boyhood club; at his peak, he turned down opportunities to ply his trade at some of the most prestigious clubs across Europe, including 11-time Champions League winners Real Madrid, highlighting his overarching quest to achieve glory with Roma. 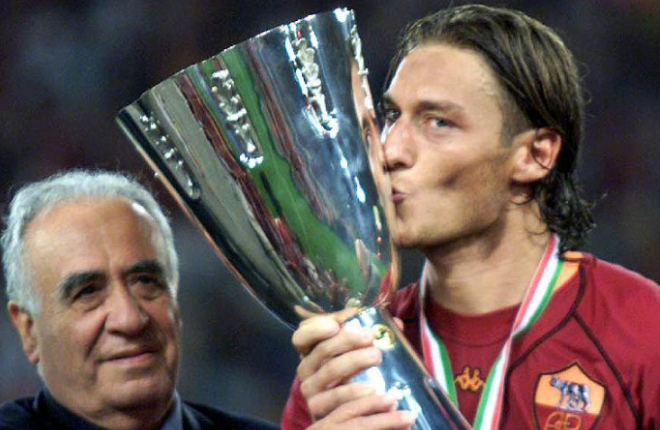 This decision proved dividends, with Totti winning the Serie A title in 2001, and when added to his 58 international caps, and a World Cup, the most significant prize in football, he seems to have ensured his legacy may be remembered at the pinnacle. Totti celebrates Roma’s Serie A victory. Credit @GentlemenUltra via Twitter. Totti may now have an opportunity to go down a new path, in which he may showcase the vast array of credentials he seems to have amassed across his footballing career. With a directorial role perhaps taking shape, he may need to have leadership skills to boast such a position, yet seems to possess these traits after becoming the youngest ever Serie A captain aged 22 in October 1998. In addition, he seems to have attained an in-depth understanding of how to adapt to different situations, as throughout his career various managers applied the captain in a plethora of positions. This flexibility may be beneficial to him if he chooses an alternate role, perhaps showcasing his public speaking ability, aiming to motivate the younger generation to pursue a career at Roma. There seems to be multiple opportunities which Totti may pursue, yet perhaps his short-term goal may be assisting Roma in finding his replacement. Whilst the club seems to boast an abundance of accomplished talent to replace him position-wise, his leadership skills may need to be passed on to his successor, Daniele De Rossi, and Totti may aim to hone his countryman’s qualities by utilising his vast experience in the capital. As such, his influence, and impact, on the club seems to have been profusely noted, and whilst his international caps and winners medals may fill his trophy cabinet, perhaps he may be most notably remembered for his loyalty which, in a pivotal period in the sport where monetary incentives seem to have ever-increasing importance, his success at one club may act as the catalyst in other players striving to replicate his feat. How may Totti continue to enhance his legacy with his next career choice?